Plainville head coach Tim Shea took over the program in 2016 and inherited a team decimated by graduation losses. With many sophomores and other underclassmen in key roles, the Blue Devils endured an 0-10 season as they gained valuable experience. Last year, after another rough start to their season, the Blue Devils started to live up to their promise in the second half of the schedule, rebounding from a 1-4 start to finish 5-5. In the process, the team, despite losing some key seniors to graduation this past offseason, gave its followers plenty of reason to believe this season could be a big one for the program. “We’re hoping to turn the corner,” Shea said. “There’s still a lot of challenges every week, but there’s considerable development, and we’re looking forward to playing every week. Back is third-year quarterback Frank Griffin, who earned all-conference honors in the CCC Division III West last season. He’ll have his favorite target back in fellow returning senior all-conference player Brady Callahan, who can also line up at running back. Other key skill position players include senior running back Brendan Quilter, senior receiver Marcos Gutierrez and promising sophomore receiver Christian Collin, along with a now-healthy junior running back Mason Sarra. Other key newcomers are sophomore receivers and defensive backs Dom Chambrello and Xavier Pastor. While there’s work to be done, the Blue Devils are looking for big things this season. 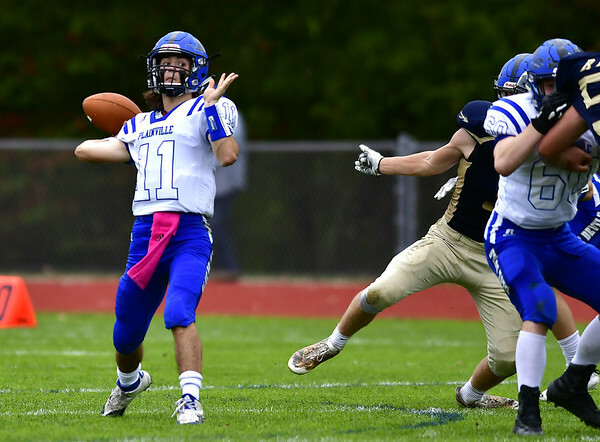 Plainville’s approach - focusing on one game at a time - will not change. Callahan said the team is focused on meeting its goal of reaching the postseason. Posted in New Britain Herald, Plainville on Wednesday, 5 September 2018 21:02. Updated: Wednesday, 5 September 2018 21:05.